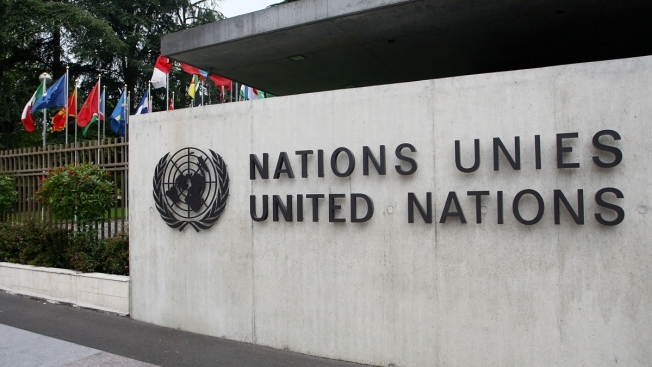 Evil geniuses "could not design a bureaucracy so maddeningly complex"
The United Nations emblem is seen in front of the United Nations Office on June 8, 2008 in Geneva, Switzerland. The United Nation's "most grievous blunder" in recent years is its counterterrorism action in Mali, according to an unusually scathing goodbye note written by former head of field operations Anthony Banbury in the New York Times, NBC News reports. The U.N. sent 10,000 troops to the West African nation in 2013 to counter Islamist extremists, but Banbury says the force was inexplicably "unprepared for counterterrorism and explicitly told not to engage in it." Banbury, who has left the U.N. to work for Vulcan, Microsoft co-founder Paul Allen's investment and philanthropic company, blames red tape and bureaucracy, including in the international body's response to the Ebola epidemic. "If you locked a team of evil geniuses in a laboratory, they could not design a bureaucracy so maddeningly complex, requiring so much effort but in the end incapable of delivering the intended result. The system is a black hole into which disappear countless tax dollars and human aspirations, never to be seen again."